These spicy chocolate gingersnaps perfectly celebrate the holiday spirit — with nourishing ingredients, too! Yet these cookies lay all those concerns aside. They're not only fun to make, but fun for our tummies too! The sprouted crispy almonds and arrowroot powder make for easy digestion, while the chocolate and molasses make the gingersnap flavor shine. The result? A batch of cookies that will forever be on our Christmas cookie baking list! To eliminate the dairy, feel free to swap out unsalted butter for coconut oil. However, be careful that in beating it with the sugar it doesn't become too liquid-y. Also, reduce either the fresh or powdered ginger if your littles aren't such a fan of extra spice. Enjoy! In the bowl of a food processor with the blade attached, pulse the crispy almonds until finely ground. Combine with arrowroot, soda, cocoa, and spices. Set aside. Cream butter and Rapadura. Add molasses, then add dry ingredients. Form about 1 tablespoon of dough into a ball and place on a greased (or lined with parchment paper) cookie sheet. Repeat with all dough. Bake for about 20 minutes. After 5 minutes, gently flatten the balls into rounds using your finger or pressing down lightly with a fork. Remove to cooling racks and let cool completely before storing in the refrigerator. Serve with a cup of hot chocolate, tea, or cold milk! *To make crispy almonds, combine almonds with filtered water and a small amount of sea salt, to taste. Set in a warm place for 7 hours or overnight. Drain, then spread on a cookie sheet or dehydrator tray and dry at low heat (115 degrees Fahrenheit or less) for 12 to 14 hours. Nuts are done when they are dry and crisp. What is your favorite treat during the holiday season? YUM! I’ve never had a chocolate gingersnap before, but I’m willing to try! Where is the chocolate in the recipe!? Hi Marian! It is the 2 T of cocoa. Oh MAN those look amazingly delicious!!! This looks great and gingersnap is a fav of my husband…and hate to admit, i’ve never made them. WOndering what can substitute for the rapadura/sucanat ..would honey work or be too much liquid? Jayne, while I did not test these with honey, my past experience has been that honey can cause the batter to be too runny and the cookies to brown too fast. I would try this: add a small amount at a time to taste and watch the dough. It should be solid enough to roll into balls so maybe have some extra almonds and arrowroot on hand to help along the consistency. When you get it to where it looks like it should work, bake up a small amount (2?) and see what they do. That way you can continue to adjust without ruining a whole batch. Does that make sense? I hope that helps. Good luck with them! I saw these on Facebook and had to come check them out! Hi Jenny, with the amount of almonds do you mean 1 cup+ 1/2 cup? 0r just 1/2 to 1 cup? Saving this one for Christmas…. I am looking forward to trying these. I wonder if we could use this recipe to do shapes? If not, do you have a recommendation that I can use with my girls? Hi Denise, I don’t know that these would roll out very well like traditional sugar cookies. You could however roll them into balls of different sizes and combine them for simple shapes (such as a teddy bear). One thing that I had wanted to try was a cookie stamp with a nice, well defined image. Instead of flattening them out with your fingers, use the stamp. I think the imprint would stay. I hope that helps! These look great. If pressed for time, could almond meal be substituted for the ground crispy almonds? About how much? Mara I would imagine so, the only disadvantage would be that the almonds would not be soaked and sprouted; but I think it would work. I would add it gradually, monitoring the stiffness of the dough just in case the consistency of the meal is a bit different. You want to be able to roll the dough into a ball that will hold its shape. Good luck with them! Looking forward with great anticipation to making these and sharing them with family at Christmas. Question: What can be substituted for the arrowroot flour? Would coconut flour or a GF all-purpose baking flour work (I have both Bob’s Red Mill and Hodson Mills brands)? Thanks! Connie, I do not have any experience with coconut flour so I would vote for the GF all purpose baking flour. Add it gradually monitoring the consistency, and then perhaps bake a few to see how they turn out before baking the entire batch. Good luck with them! I hope you and your family enjoy them. I tried this recipe, but ended up with a tray full of melded splodge. Total baking disaster – and I went to such great efforts (not to mention expense) to get all the ingredients, too. Gluten free baking is a real challenge! Louise, I am so sorry! That is so frustrating especially when you are trying something new and have gone to all the trouble to get the ingredients. I wonder what happened. If maybe your arrowroot powder was of a different consistency? If you do decide to try it again, maybe add more of that or the almonds until the dough holds together, and then perhaps try refrigerating it. You might bake just one or two at a time as you make your adjustment so you don’t have to deal with another tray of melded splodge. 🙁 Let me know if you decide to make them again. I can’t wait to try these. I’ve been making the nut butter sourdough cookies for my nieces lunch boxes, but they are a little burned out on them. This came at the perfect time. I was searching for something new to make after their school break! Thanks! ! Good luck with them Nancy! I hope they turn out for you. Could I grind my dried, organic ginger to get the powdered amount? Also, how would I go about subbing dates instead of the Rapidura? 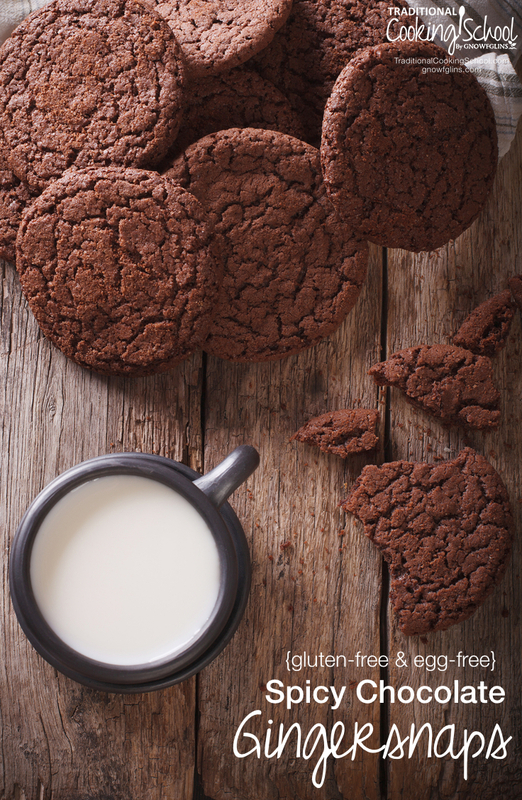 I love the idea of chocolate ginger snaps-thanks for the recipe! Laila, as far as the ginger goes, yes I’m pretty sure that you could. However, I don’t really know about substituting the dates for the Rapidura. I have never actually tried that before. I would recommend making these up in a small amount first, trying your substitutions, before making up an entire batch just in case it didn’t work out or needed some adjustments. If you try them though, please do let us know how it works out for you. When you say after 5 mi flatten them – do you mean after 5 min of baking or after the full baking time and after 5 min of cooling? Reema, flatten after they have been in the oven for five minutes. Take them out, smash them down, and then return to the oven for the remainder of baking time. I need to watch my sugar grams. I am not familiar with rapadura or sucanat. I know coconut sugar is a low GI. HYas anyone tried substituting it for the rapadura /sucanat? Although I haven’t tried it in THIS recipe, I often use coconut sugar in recipes that call for sucanat or rapadura and find it works well. I plan to try this particular recipe next week with a few tweaks and will post how it goes.